We offer next working day delivery service if your order is placed before 11am, if you have a preferred future date for delivery please select when placing your order. Please ensure the recipient address is accurate and up to date, please also provide telephone numbers so the courier can call in case of difficulties. We use a reputable courer service to complete the next working day delivery service, we have an excellent success rate of next day service but very occasionally factors beyond our control can sometimes cause delay, if your hamper delivery is time critical, birthday etc you may like to request the delivery the day before just to be sure. All deliveries are required to receive a signature in order to complete the delivery procedure. The courier may at his discretion leave the parcel in a safe place and leave a calling card giving the location of the parcel, altenatively if the recipient is not at home on the first delivery attempt made by our courier, a calling card will be left for the recipient indicating delivery has been attempted and the recipient will be required to contact the depot to arrange a more convenient time for delivery. If the recipient fails to contact in good time the hamper will be delivered back to the Welsh Hamper Company and a charge may be made for re-delivery to the original or alternative address. The purchaser will also be charged for any items which may become unsuitable for sale and need replacing, (eg. perishable and chilled items like cheese and ham which have short shelf lives). 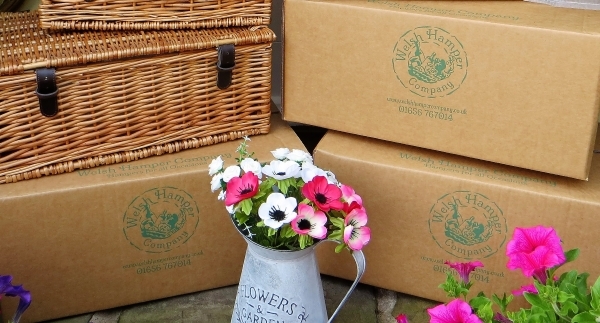 When ordering your hamper if you feel there may be difficulties with delivery please let us know, it may be possible for the hamper to be left with a neighbour which may solve some delivery issues. A packing and delivery charge of £7.50 per hamper is payable on all orders unless stated otherwise to mainland England & Wales. There will be an extra charge for Scotland, the Highlands, the Isles, Northern & Southern Ireland, please call or email us for the total cost. We use a courier service for deliveries; all hampers are beautifully packaged and can be sent with a personalised message. All baskets are made from wicker and can be used again for many uses. We always endeavor to make every effort to supply the original products however some contents may change depending on seasonal availability.